This 2 bedroom apartment with shared pool is located in Benidorm and sleeps 4 people. It has parking nearby. Take a look at this great 2 Bedroom Apartment located in Edf. Auge 4 in the Rincon De Loix area of Benidorm. The property is located on the 10th floor and has two Bedrooms, one double Bedroom and one twin Bedroom sleeping a maximum of 4 persons. The master Bedroom has fitted wardrobes and leads onto the Open Balcony. There is a fitted Bathroom, with Bath/Shower and washing machine and a Fitted Kitchen. The property has a great sized Lounge Dining Room, that leads onto the Open Balcony. 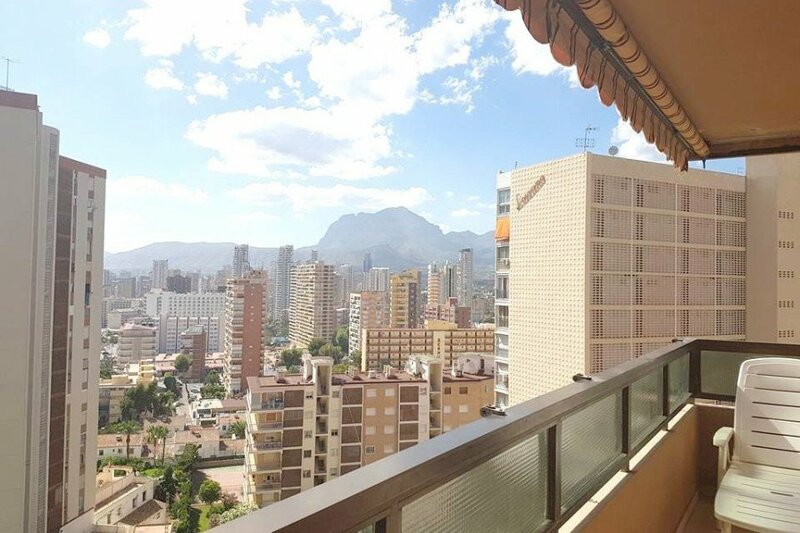 The Open Balcony is a great area for dining, and relaxing on those hot summer days here in Benidorm with great sea and mountain views across Benidorm. The property boasts UK TV and is fully equipped for holiday rentals. The apartment is close to the local supermarket, pharmacy and church and is within a few minutes walk to local shops ,eateries and bars situated along the Calle Londres. It is approximately a 7-8 minute walk to Levante Beach, whilst the apartment block has a communal swimming pool seasonal opening and off street parking within the communal parking area for clients is available.